The following is a summary of crimes that have been reported in the Central Etobicoke area during the previous week. 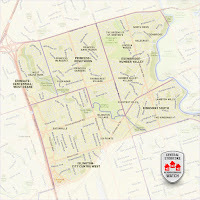 These reports are collected from the Toronto Police Crime App published by the Toronto Police Service. Auto Theft (Outside) near Bloor St. West / Royal York Rd. Robbery (Commercial) near Bloor St. West / Wendover Rd. Break-and-Enter (House) near Bloor St. West / Kingsmill Rd. Break-and-Enter (House) near Dorlen Ave. / Harrop Ave.
Robbery (Commercial) near Burnhamthorpe Rd. / Martin Grove Rd. Auto Theft (House) near Goswell Rd. / Lochway Ct.
Auto Theft (Outside) near The East Mall / Lynnford Dr.
Break-and-Enter (House) near Paulart Dr. / Kebral Ave.
Break-and-Enter (House) near Edgehill Rd. / Westridge Rd. Thefts from Vehicles: There was 1 reported theft from a vehicle in the past week; near Islington Subway Station in Six Points. Please note, that thefts from vehicles tend to be under-reported. If you have had something stolen from your vehicle, please report it to the Police.